The front-page murder of a Big Easy D.A. The gripping true story of the first judicial murder of the 20th century is delivered in stunning detail, from the crooks and crevices of the city streets and courthouses, to the very fibers of the hangman’s noose. The murder of the newly elected District Attorney J. Ward Gurley sent shock waves through the city of New Orleans not only because of the brutal and brazen nature of the killing, but because the suspect’s name had previously been in the city newspapers. 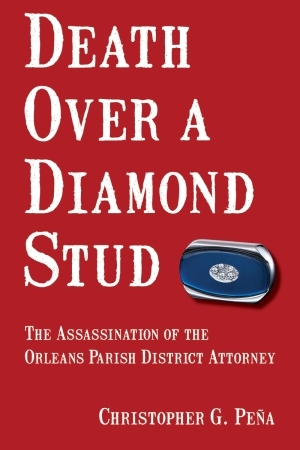 The journey of Lewis Lyons from working family man to the cold-blooded killer of his own attorney is a heartbreaking saga that begins with a tragic miscarriage of justice concerning a stolen diamond stud. Writer and researcher Christopher G. Peña is a leading historian of Southeast Louisiana Civil War history. In addition to authoring numerous essays and articles on the history of the Pelican State, Peña has published several books exploring various Louisiana historical sites, events, and figures. He earned his Bachelor of Arts in both theatre and history from Nicholls State University and a Bachelor of Science and Master of Science in nursing from the University of Texas Health Science Center. Really like this book and hope there will be another book!